eJoseph Leidy Elementary School, in West Philadelphia, another school that is closed this academic year. The end of the last school year provided a glimpse of the school funding crisis to come, as 24 public schools were shuttered. As these institutions prepared to close, Zoe Strauss initiated the Philadelphia School Closings Photo Collective. 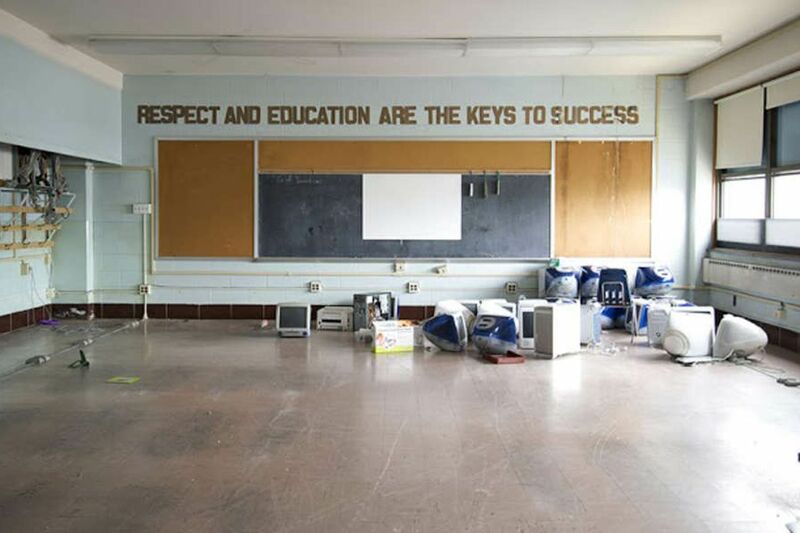 Ten local photographers roamed the city, collecting visual testimony to the abandonment of part of Philadelphia's education infrastructure. The pictures are a gripping reminder of the real-world effects of policies decided far from the neighborhoods where the impact is felt. The collection shows, in stark detail, what these policy choices mean to students, faculty, and the communities - predominantly lower-income and African American - who will be left with the hulking remnants. The Scribe Video Center and the Philadelphia Public School Notebook have invited the collective to exhibit their findings. The exhibition, curated by collective member Katrina Ohstrom, will open Wednesday, followed by the screening of two short documentaries on the crisis. "What I see when I go into schools really contradicts the narrative the public is being fed about poor kids in urban areas, and their teachers, not caring about education," says Ohstrom, who was recently documenting public-school closures in Chicago for Jacobin magazine. The exhibit opening, which costs $5 to attend, is 6 to 9 p.m. Wednesday at the Scribe Video Center, 4212 Chestnut St., third floor. The exhibit continues, for free, through Jan. 17. Have an event to include in Jawnts? E-mail jake.blumgart15@gmail.com.